[Adapted from the Excellent Book by Larry Burkett. Your Money After the BIG 5-0: Wealth for the Second Half of Life. Nashville: B&H Publishing Group, 2007, 215-219. Why would you settle for such brief, short-term, inadequate, low-yield dividend pleasures offered by the world when eternal pleasures—tens of thousands of years of pleasures—await? Knocks and some earned by prudently following biblical counsel and teaching. Take hold of the life that is truly life—the abundant life available through a personal relationship with the Creator God and His Son, Jesus Christ. We have purposed in this book to share all the financial wisdom we possess, all the wisdom we could borrow from others, and all the wisdom available in God’s Word. Our recommendations may vary from the world’s advice. We encourage you to keep working in some capacity during retirement, though the world says you are entitled to leisure. We recommend to pay off debt, though others give reasons to keep or increase debt. We recommend diversifying to preserve, though the secular instinct is to get rich quick. It is hard to go against the grain of a materialistic, status-seeking society. The story of Mr. and Mrs. Thing provides a vivid reminder of truth. Mr. and Mrs. Thing are a very pleasant and successful couple. At least, that’s the verdict of most people who tend to measure success with a “thingometer.” When the “thingometer” is put to work in the life of Mr. and Mrs. Thing, the result is startling. There is Mr. Thing sitting down on a luxurious and very expensive thing, almost hidden by a large number of other things. Things to sit on, things to sit at, things to cook on, things to eat from, all shiny and new. Things, things, things. Things to clean with and things to wash with and things to clean and things to wash. And things to amuse and things to give pleasure and things to watch and things to play. Things for the long, hot summer and things for the short, cold winter. Things for the big thing in which they live and things for the garden and things for the deck and things for the kitchen and things for the bedroom. And things on four wheels and things on two wheels and things to put on top of the four wheels and things to pull behind the four wheels and things to add to the interior of the thing on four wheels. And there in the middle are Mr. and Mrs. Thing, smiling and pleased as punch with things, thinking of more things to add to things. Secure in their castle of things. Do they sound familiar? Mr. and Mrs. Thing may be secure in their castle of things, but that’s not the end of their story. Here it is: Well, I just want you to know that your things can’t last. They’re going to pass. There’s going to be an end to them. Oh, maybe an error in judgment, maybe a temporary loss of concentration, Or maybe you’ll just pass them off to the secondhand thing dealer. Or maybe they’ll wind up a mass of mangled metal being towed off to the thing yard. And what about the things in your house? Well, it’s time for bed. Put out the cat, make sure you lock the door so some thing-taker doesn’t come and take your things. And that’s the way life goes, doesn’t it? And someday, when you die, they only put one thing in the box. You. About the Author: Larry Burkett (Pictured Above) was among the people who played a role in fulfilling President John F. Kennedy’s dream of landing on a man on the moon. After serving as an electronics technician in the Air Force’s Strategic Air Command, Burkett, who had degrees in marketing and finance, headed an experimental facility that served the Mercury, Gemini, and Apollo manned space programs. After Larry and his wife, Judy, became Christians in the early 1970s, he began extensive studies of the Bible in which he found more than 700 direct and hundreds of indirect references to money. Just one year after becoming a Christian, he found himself living in Atlanta and working as a financial counselor with Campus Crusade for Christ. Concluding that most of the problems facing Larry’s counselees were the result of mismanaging funds, the Burketts began Christian Financial Concepts (CFC) in 1976. Their first office was in the basement of their home in Tucker, Georgia. In 1977, the first CFC newsletter was published. More than simply a collection of stories, the newsletter contained articles to help every family with their finances, including practical ideas for around the home, stewardship, personal testimonies, and biblical principles for managing money. In 2003, “Money Matters” now has a circulation of nearly 200,000. 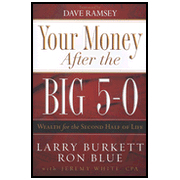 Larry Burkett was also the author of over 50 books, including Debt-Free Living, Your Finances in Changing Times, and The Coming Economic Earthquake, and a guide for kids on money management, called What If I Owned Everything. Together with Ed Strauss, he wrote the World’s Easiest Pocket Guide series with books on everything from buying a first car, renting an apartment, getting a credit card, and more. Larry even branched out into the fiction arena with best-selling novels such as The Illuminati and Solar Flare. In 1995, Larry was diagnosed with cancer which led to the publishing of several other books, including Nothing to Fear: The Key to Cancer Survival which Burkett used to share his own personal experiences and offer insight to his readers. One of the central principles Larry taught is that we don’t really own things; we are simply stewards and managers of what God has entrusted to us. In Larry’s case, that included the ministry he founded. Until his death July 4, 2003, Larry and Judy Burkett resided in Gainesville, Georgia. He is survived by his wife Judy, four adult children, and nine grandchildren.